Dr. Gonzalez-Cuyar is a neuropathologist who serves as an attending physician in UW Medicine Pathology’s Neuropathology service based at Harborview Medical Center in Seattle. Dr. Gonzalez-Cuyar’s clinical practice focuses on neuromuscular pathology, neoplasms of the brain, spinal cord and pituitary gland, and ophthalmic pathology. Dr. Gonzalez-Cuyar serves as the neuromuscular pathology section head providing accurate and timely diagnoses to clinicians treating patients with neuromuscular conditions from the UW Medicine system and offers consultative services throughout the WWAMI region. Dr. Gonzalez-Cuyar hosts a monthly interdisciplinary Neuromuscular-Rheumatology conference designed to review clinical and pathologic aspects of interesting cases and to teaching trainees. Dr. Gonzalez-Cuyar’s NIH-funded research is focused on the neuropathologic changes associated with heavy metal exposure. Dr. Gonzalez-Cuyar is part of a multicenter collaboration including the University of Washington (Seattle, WA), Washington University (St. Louis, MO), and the University of the Witwatersrand (Johannesburg, South Africa). He serves as the neuropathologist examining the brains of manganese exposed workers. 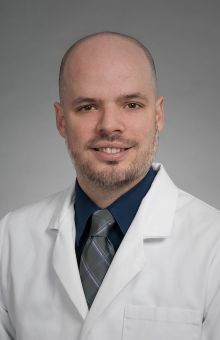 Recently Dr. Gonzalez-Cuyar has also been involved with UW colleagues in departments of Radiology, Pathology and Environmental and Occupational Health Sciences working to characterize radiologic and pathologic changes associated with gadolinium exposure in patients that received gadolinium based contrast agents. Lastly, Dr. Gonzalez-Cuyar is also involved in several collaborative and translational projects associated with neuro-oncologic and neurovascular pathology. Dr. Gonzalez-Cuyar has a diverse teaching portfolio and is involved in the education of medical students and graduate students. He also is active in teaching UW and non-UW residents/fellows (pathology, rehabilitation medicine, ophthalmology, neurology, and neurosurgery) offering didactic conferences and/or microscope case review. Dr. Gonzalez-Cuyar is the associate director of the neuropathology fellowship training program and director of the UW school of medicine neuropathology clerkship (PATH 677). Dr. Gonzalez-Cuyar holds triple diplomate status by the American Board of Pathology with certifications in anatomic pathology, clinical pathology, and neuropathology. He is a fellow of the College of American Pathologists.